Looking for something to curl up with over the holidays? This was a long, strange year, and what I needed most of all was engrossing narratives neither too enamored of their own cleverness, nor stylistically too filigreed. I enjoyed all of the below and recommend them to those of you seeking transportation to another world. Illustrations of a cluster of figs and a Japanese flying squid, by Lohitha Kethu, the latter of which currently graces the front page of my library’s website as part of an exhibit at our medical library. Scientific illustration’s been on my brain lately, as the digital arts and humanities initiative I’ve led for some years had a panel + workshop this spring that was on the topic. Kethu’s illustrations grabbed me because one was quite familiar, but the other—well, I like figs, and the clarity and detail of her work brought them immediately to life. Corey Hannah Summers‘ work caught my eye as I was on the way out, off in a nook that I hadn’t seen walking into the expo. She had a few more original paintings on display than some of the students, which I appreciated, as well as a crop of stickers, a few of which I had to have (those teeth!). 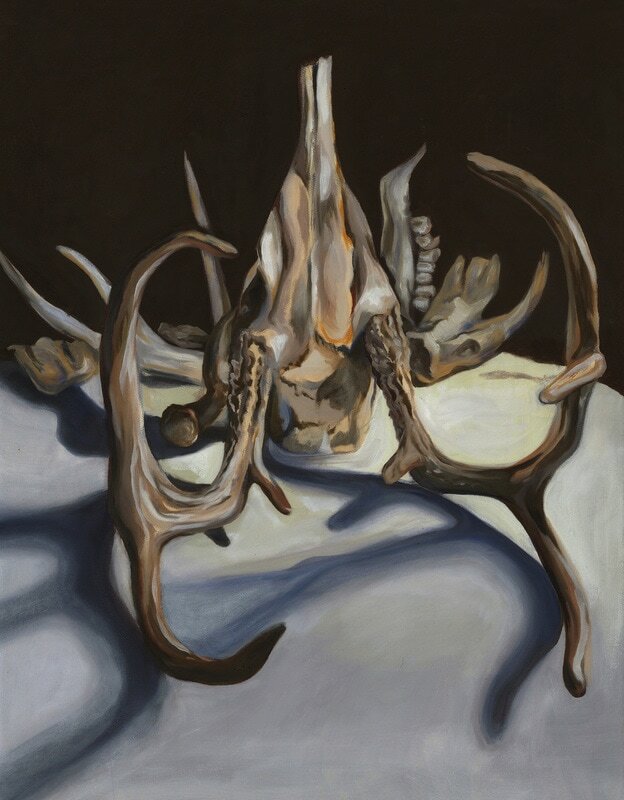 Summers’ paintings can be seen on her website, but here’s an antler study that grabbed me from across the room. The warm accents really made it stand out, given how many bones-and-antlers paintings I’ve seen that go entirely warm or cool. 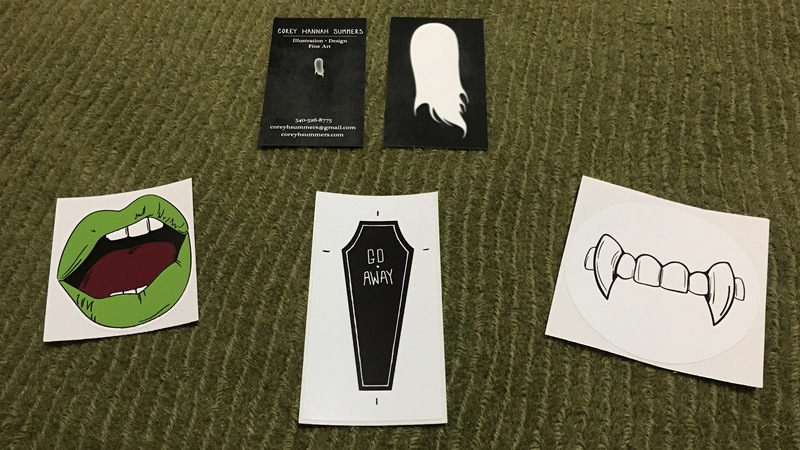 There were many, many other cool things on display, from Elly Call‘s tarot deck, to Norine King‘s stickers of heroic women, to Mike Collier‘s fangs and gaming-related swag, to Will Sullivan‘s atmospheric concept art. Near the start of the show, my eyes were caught by Emma Welch‘s Parasite. 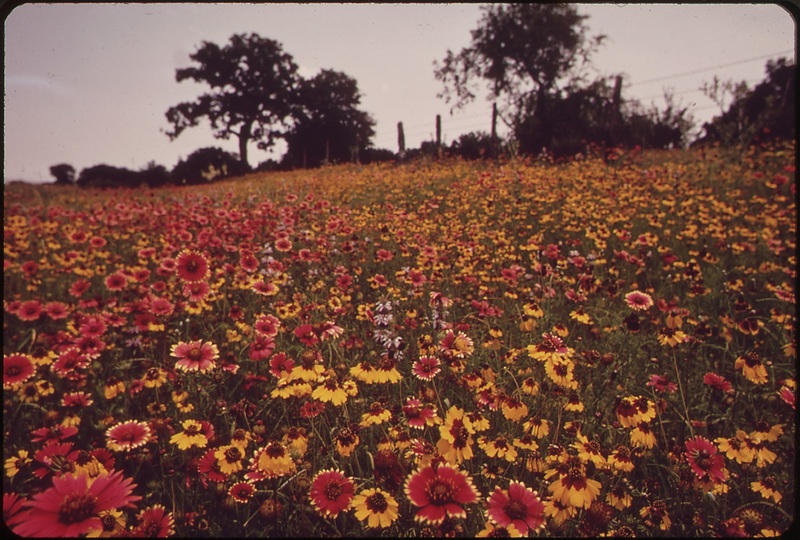 Parasitic & symbiotic imagery always gets me, but I’ve been consuming even more art than usual that plays with these themes, from a re-watch of Nausicaä of the Valley of the Wind, to Jeff VanderMeer’s new novel, Borne. Really, the overall quality of the show was outstanding. I went in not knowing what I’d see, and I was repeatedly struck by the work our students are doing. It should also be said that the “artists alley”-type setup in The Depot really worked well, and the turnout was great, with folks turning out from all over the university and surrounding community. Sunday we went to Arts in the Park in Byrd Park, a first for us, despite having lived here for years. The arts and crafts on display were high quality, and the weather was great for walking around. With 450+ vendors, there was more than enough to see, even passing over the stuff that wasn’t our thing. The first booth we stopped at was that of Mary Ann Vessey, a painter from the Shenandoah Valley. 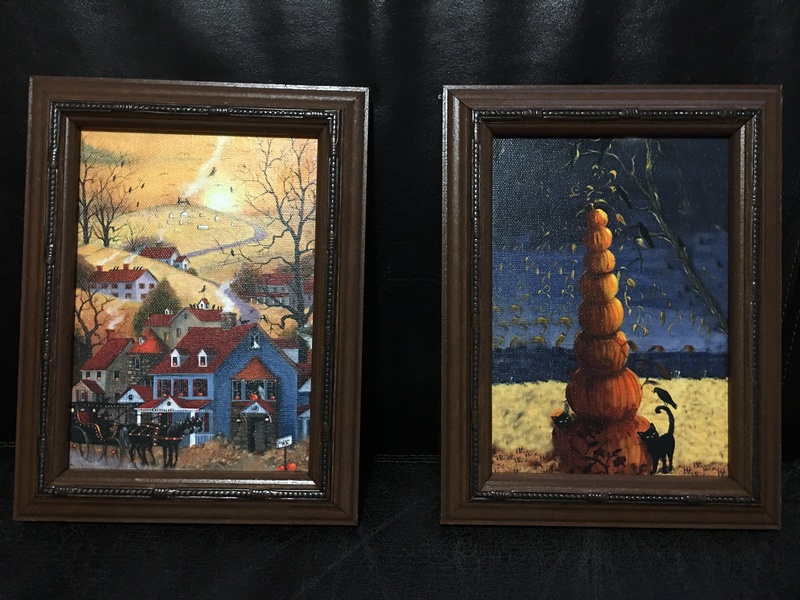 She uses her paintings to tell stories and show off the land she loves, often through the lens of changing seasons, and there were a number of holiday-themed paintings on display, prints of two of which we picked up. Halloween is having a moment right now, but it’s also our thing, for all the reason you’d imagine. 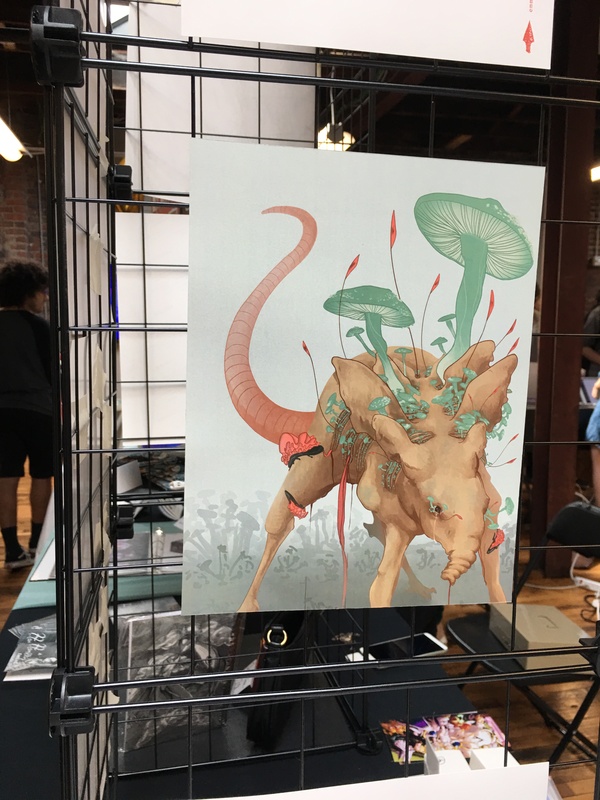 We wandered the show and had a great time, admiring Debi Dwyer‘s 3D stained glass creations and Molly Sims‘ vivid, beautiful animals, among other things. Stephen Brehm‘s oil paintings were among my favorite in the show, as he has both a way with light on water, and a deft hand at bringing background light and color into the shadows. There were plenty of paintings to be found at the show, from abstract to whimsical to landscape, but his stayed with me. 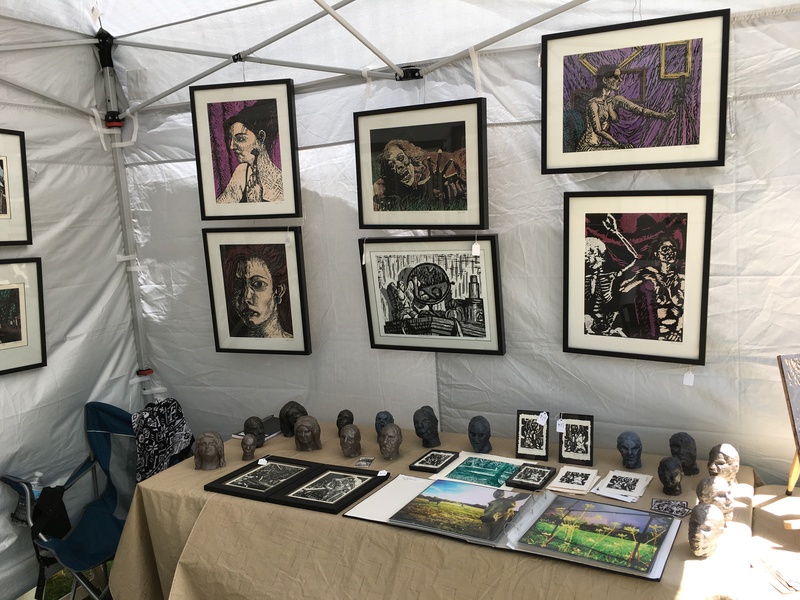 Toward the end, we found our way into what was the most exciting and surprising booth in the show, that of Allison Funk, an artist specializing in prints, from woodblock to linocut to monotype. I wasn’t sure when we went to the show what, if anything, I’d be buying, but that immediately switched over from an “if” to “which one” when I saw her prints. It’s hard not to think of Expressionist woodcuts looking at Funk’s work, but you can see shades of more contemporary styles, as well. 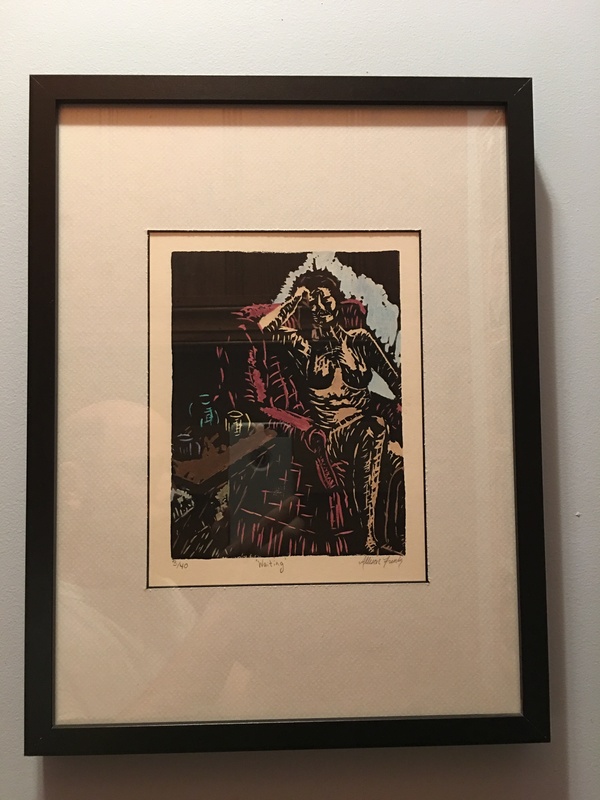 Handling of flesh that echoes the honesty of Freud, compositions with the feel of Albright or Munch: these and many more things struck me, but—to be clear—they struck me because of her deft use and strong style. From the way she works with shadows to her use of reflective surfaces, Funk clearly has a style of her own. I considered but did not buy a print of a version Funk did of an iconic scene from The Walking Dead. I’ve seen various art derived from the show, but none that have been as good. Funk’s take on it was as clear and iconic as the many subsequent versions we’ve seen of Night of the Living Dead, and I think it will appeal to many. For me, it encapsulates the pathos of Kirkman’s vision as clearly as anything else I’ve seen. 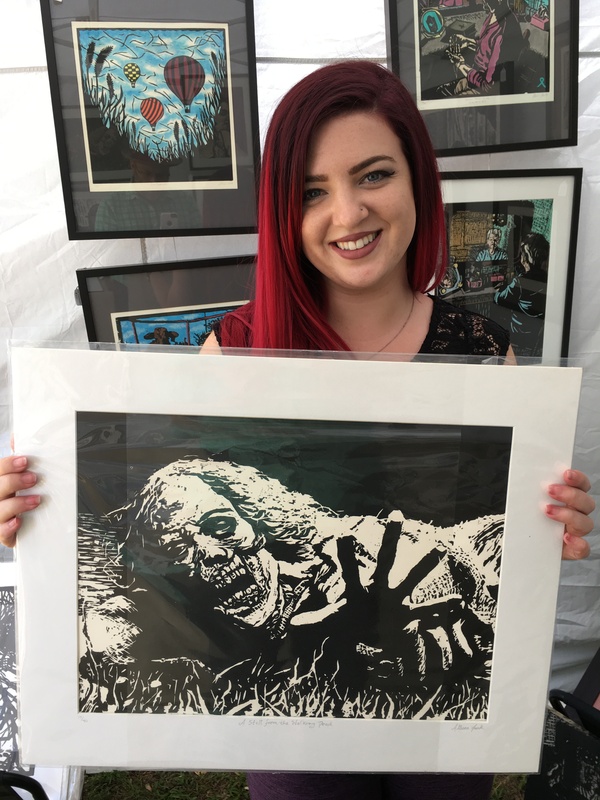 Ultimately I walked away with a quieter print, a linocut with watercolor that spoke to me the moment I walked into the booth. Funk’s work is “pensive” in the best possible sense of the word, and it’s no surprise she discusses “self-reflection” in her artist’s statement. The prints she pulls are all fundamentally moments taken out of time, with tension rising from things have come and gone, or are yet to be. Her vision feels distinctly more urban than I would expect from any given artist out of Staunton. And it’s happily not full of the contemporary clichés that connote “urban,” but istead is part of the patchwork of city life that has captured the interest of creators as diverse as George Bellows and Kathe Koja. Her scenes are tight, with a world pressing in that is kept at bay by walls and curtains, where her subjects consider things that are just out of sight, be they people or ideas. I look forward to seeing her work grow and change over time. For the last couple months I’ve been on social media very little. This was on account of sundry deadlines, projects, and all the other reasons people typically get offline. I’ve been happier and measurably healthier since then, albeit missing the connection. The horrors of this past week have spurred me to political participation, but not to dwell constantly on injustice, and I’m so glad not to be as much in places where the parade of atrocities never ends. I still hew to Wordsworth’s famous formulation, and I’m endeavoring to live for the things I care about most. At times when the world does press in, I think it’s important to remember the things that don’t. This week I was talking with James Jenkins of Valancourt Books about the merits of reading classic (or simply older) fiction, and I don’t think it can be overstated. One of the best things I’ve done for myself as a reader or writer in the last year was read all of M.R. James‘ tales, of which I’d previously read some, but not all. No one asked me to do so; as a rule, dead authors are not particularly demanding. Still, the desire was there in me, and it led in a roundabout way to my writing “En Plein Air,” a short story that will appear this October in volume two of Nightscript, and which I think is one of the most effective things I’ve written to date. Last week I placed an order for a small pile of books, using some of the earnings from my Richmond Young Writers gig, recent things that I’ve read from the library or about which I’ve heard really excellent advance praise. What I also look forward to reading are the things that nobody is urging me to read. Part of that involves plumbing bibliographies and reference books, part of it involves finding reprints, and part of it involves hewing to the titular requirement of this post. The survival of work from the past can be a chancy thing, and what is saved is not necessarily good, and what is lost is sometimes better forgotten. The finding of it, however, is part of a quiet and almost Gnostic kind of quest that demands nothing. It is the sort of thing that many authors have engaged in over the years, and which cannot—perhaps should not—always be repackaged for the demands of social media. Some quests are public, some private, but either way, I think that we forget our quests at the peril of our lives, to say nothing of our art. 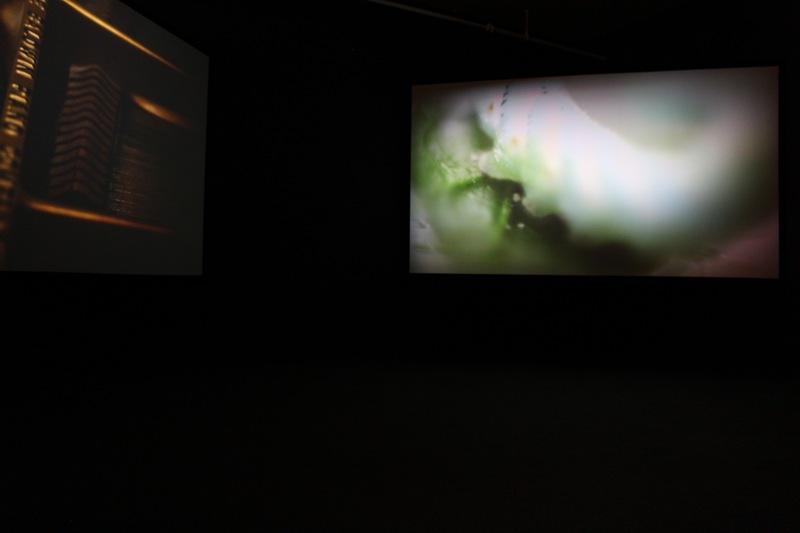 Yesterday I visited VCU’s Anderson Gallery to see round one of the 2016 MFA Thesis Exhibitions, and I was unexpectedly blown away by Para, the two channel video that William Matheson was showing. Saying things like “it looked very professional” is sort of canned, and maybe not even appropriate for a student show, but certainly it stacks up nicely with pieces I’ve seen in big venues, and it’s the kind of exciting work that I look forward to seeing more of when the VCU Institute for Contemporary Art launches. Matheson uses nicely varied imagery, including shots of parasitic wasp research. 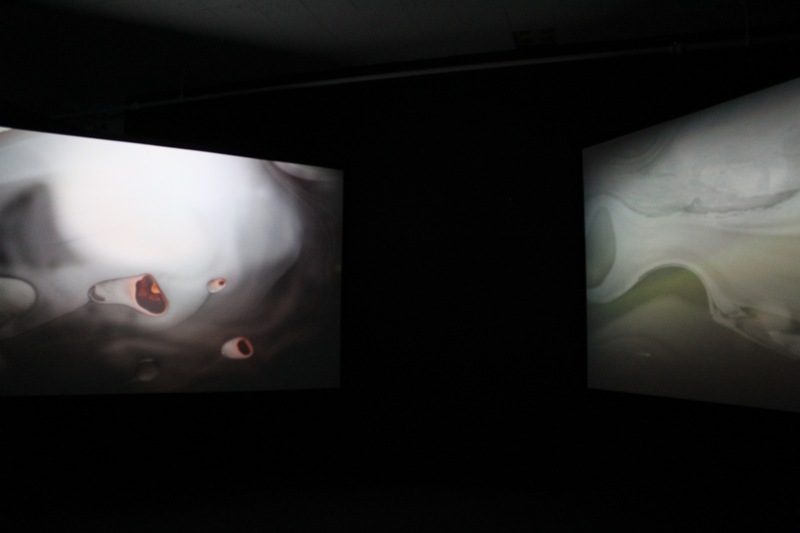 These are juxtaposed and interlaced with full color screen, images that play on themes of emergence, and shots of music in play. All of these are attested on the work’s description, which documents his collaboration with pianist Charlotte Roth, clarinetist Julia Lougheed, and the researchers, Karen Kester and Justin Bredlau. Matheson weaves all of this together and displays it in a coherent whole that results in a work of art that could not exist without science, and which stimulated (in me, at least) interest both in the art and the research. Para is a fine example of the intersection of science and art that’s in vogue these days, and better than many in that the display is not ostentatious. The artist had the good sense to make the work and get out of the way, letting it breathe. Kudos to him. I went to see this show because I work with his partner, but I wound up simply grateful to see a really well made piece that has me still thinking. If you want to see Para for yourself, along with a number of other fine works (I particularly enjoyed the paintings of Beatrice Modisett), the show runs until April 24, ending at 5:00 pm. This two channel video is showing at the Anderson Gallery, 907 1/2 West Franklin Street, Richmond, VA 23284-2514. 804.828.1522. Note that, while the Anderson Gallery has closed, it does open for selected events, like this one. “On the Existence of the Female Tentacle” — 312 views — All about women who write Lovecraftian fiction. “Release the Leeches!” — 175 views — Release day and my writeup, lo those several months ago, for The Children of Old Leech. “Mary Chiaramonte / Land of Strangers / Eric Schindler Gallery” — 134 views — Review of Mary Chiaramonte’s 2012 show. 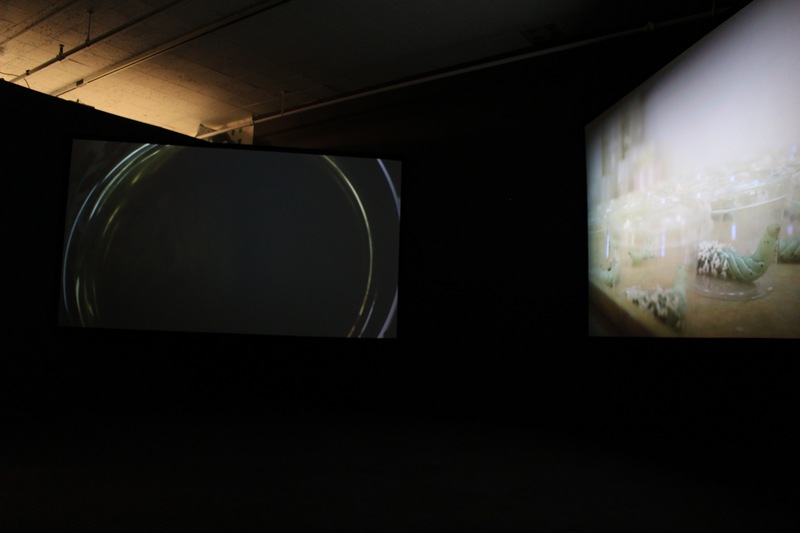 “All the Colors of the Night” — 134 views — Review of Thomas Van Auken’s 2012 show at Eric Schindler Gallery. “Writing Year 2013: Statistics, Lies, Stagnation, and the Human Heart” — 115 views — An analysis with charts and statistics of my writing activities over a seven-year period. This month James River Writers has some great events lined up, particularly if you’re interested in the role of place in fiction or the intersection of art and fiction. Want to write a more authentic RVA? Longing to mash up art and writing? Look no further. Veteran novelists and professors—and husband and wife—Carrie and John Gregory Brown talk about mining your own geographical and personal history as writers, as well as tools and techniques for finding out more about what you already think you know about your place—or places—in the world. Moderated by Virginia Pye. Thursday, April 24, 6:30-8:30 p.m., The Broadberry (a new location for this month! ), 2729 W. Broad Street, across the street from the Children’s Museum. $10 in advance, $12 at the door, $5 for students. Carrie and John Gregory Brown offer a shared presentation on writing and art: how art informs and inspires the writer, and how learning to “see” shapes and enriches writing. Short writing exercises and shared reading of those exercises will follow the presentations. Friday, April 25, 10:00 a.m. – 3:00 p.m., St. John’s Church Parish Hall, 2401 E. Broad St. $60 for members, $100 for non-members. The plan to rekindle my writing flame proceeds apace. I’m returning to writing and reading more steadily, with all the concomitant gains you’d expect. I downloaded Scrivener, am using it in turn with Dragon Naturally Speaking for dictation, or Sound Pilot (Smith-Corona scheme) when typing, or I’m writing by hand. I’ve had one co-written short story sale, I have another story in progress, and I’m getting the first chapter of Knife Fighting with Mondrian into shape, a novel I prematurely abandoned last year. 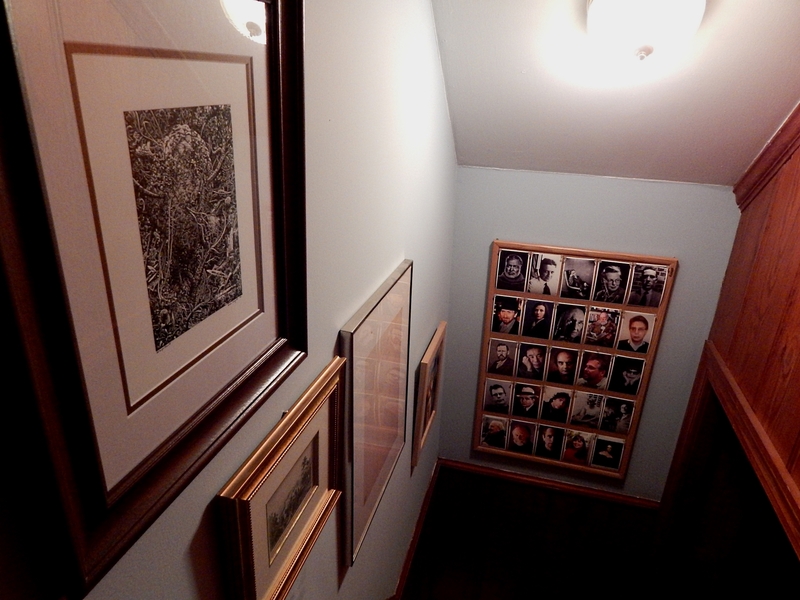 And last night I finally re-hung my inspiration board, which has been sitting in a corner for far too long. A funny thing happened, though, between now and my writerly productivity peak of a few years ago. When I got into the visual arts, I kept making analogies to writing, thinking about how one affected the other, etc.. All that time, however, I still thought of each as one thing affecting another. This is pretty much in keeping with how my life has often gone: on parallel tracks only occasionally overlapping. Lately, I see story everywhere. It’s tempting to think this is part of the leveling-up process of writing, and that it’s an aspect of my personal teleology, but whether or no, I think it’s accurate to say that I’m thinking about story more than I have at any other time in my life. Not just plots for stories or scraps of prose running through my head (they’re still there), but everywhere I look, ties that feed into narrative. Different parts of my life seem to be usefully intersecting in ways that they didn’t previously. I’ve written about why librarians should write, and I’ve written about how librarianship informs my thinking about SF, but this seems to be a new strain of intermingling. Back in February I attended the College Art Association conference in Chicago in order to co-present a poster. I attended an excellent panel there about finding common ground among museums, artists, and art historians, and many of the speakers framed their experience in terms of the overall story of the institution. A couple weeks back, a symposium on the digital humanities was held by my university’s interdisciplinary program in media, art, and text. One of the presenters, Amanda Phillips, spoke about teaching literature majors to design games, and what everyone learned in the process, from social justice to the technical aspects of building games. My work with James River Writers is expressly connected to story-land, but what I didn’t anticipate was how many RVA folks would talk to me about JRW and their interest in writing, the broad range of types of writing that my fellow members of JRW do, or how strongly some of the membership would respond to my work as a librarian. Last weekend I helped run an unconference about the New South, social justice, and technology. One of the threads that ran through it was new ways of telling stories, and while I did have a part in weaving in that particular thread, I didn’t do so for creative writing reasons: it just fit. And, of course, I work at James Branch Cabell Library. This wasn’t the reason I applied for the job, but it’s an ineluctable part of my daily existence, as is the extent to which we construct narratives around our collections, whether circulating, archival, or otherwise. Examples could be multiplied. These days it seems like storytelling flows through just about everything I do. My avocation shows up in unlikely places at work, and my thinking about libraries shows up in association with my writing. That kind of interaction used to seem strange to me, but these days I tend to expect it, and it feels only natural.